Screen Replacements $80 + tax | In Stock Now! The Device Shop has the ability to fix water damaged iPad Mini 3 as well. Between our expert technicians and state-of-the-art Drybox®, there’s a good chance we can get your iPad Mini 3 back to life. If you’ve tried to fix your iPad Mini 3 yourself but aren’t able to finish the job, we can help with that too. Give us a call or come in at your earliest convenience. The iPad Mini 3 launched late in 2014 The Device Shop started fixing screens shortly thereafter. The iPad Mini 3 model numbers are: A1599 and A1600 depending on the configuration. The parts across for these models are the same and most repairs can be fixed within two hours. 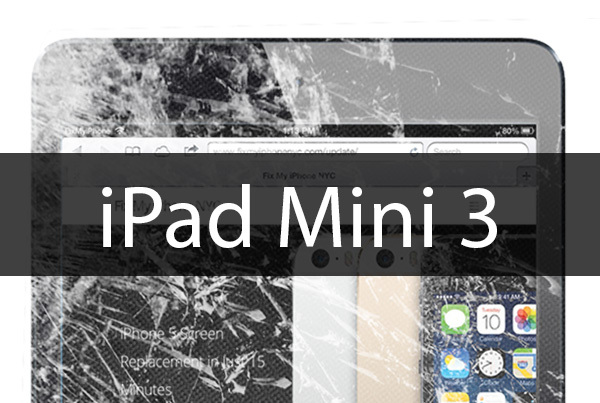 The Device Shop offers iPad Mini 3 screen replacements in just 90-120 minutes.